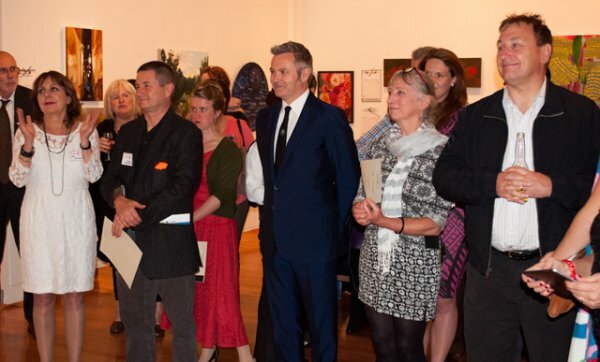 Capital Arts Patrons’ Organisation (CAPO) announced the winners of the 14 awards for 2015. It’s the philanthropic organisation’s 31st Annual Grant Round where the winners of the awards are announced at CAPO’s Annual Art Auction fundraiser and celebration, which is the culmination of CAPO’s work to support and celebrate local artists and arts patronage. 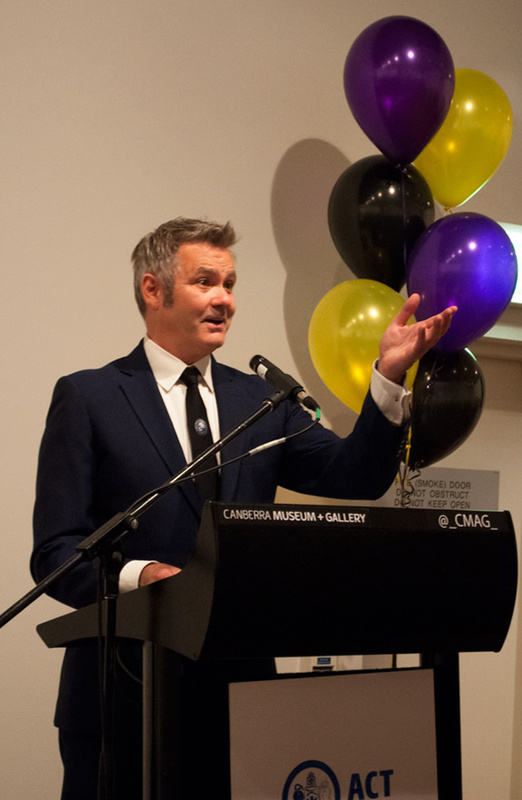 Held at the Canberra Museum and Gallery (CMAG) the annual event was surrounded by 140 artworks generously donated by local artists, the awards were presented by our new patron comedian, musician, painter and television presenter Paul McDermott, together with the Awards’ respective sponsors. The CAPO Awards provide financial and in-kind support for a range of new arts projects by emerging and established artists. 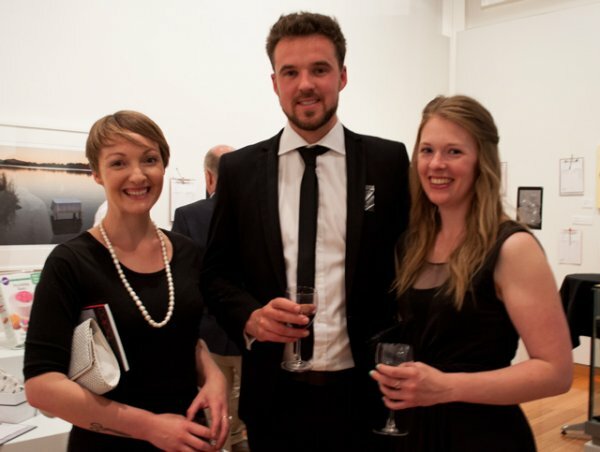 The CAPO Fellowship Award, the Rosalie Gascoigne Award, and the Ambassador Award are funded through the sale of donated art at the annual art auction. Other awards are sponsored by businesses trading in our area. CAPO’s most prestigious award the CAPO Fellowship (worth $15,000) was presented by Patron Paul McDermott to glass artist Kirstie Rea. Kirstie being the 2015 CAPO Fellow intends to use the Fellowship to support a major survey covering two decades of her work, resulting in an exhibition at Canberra Museum and Gallery in 2015. 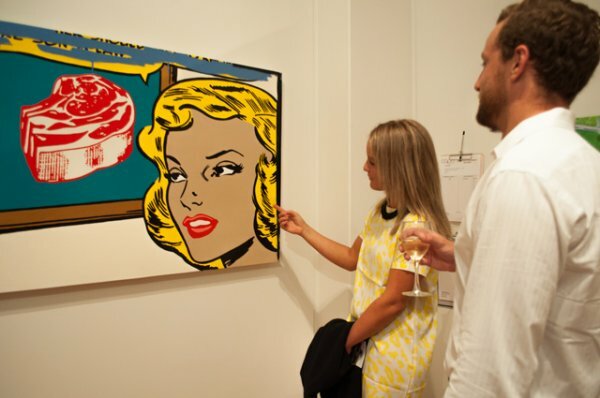 Peter Maloney winner of The CAPO Ambassador Award will use his grant to produce a series of large scale paintings to be exhibited at Utopia Art Sydney during 2015. With this body of work he’ll be exploring new ways of using colour and incorporating audacious texts. The Rosalie Gascoigne Memorial Award has been presented to Jacqueline Bradley. This grant will fund the completion of a new body of work originally conceived during a residency in Gros Morne National Park, Newfoundland. The outcome of the project will be series of 14 wearable sculptures and 2 performances in these works. The Macquarie Wealth Award goes to Tom Skeehan who will apply the grant to the Skeehan Studio to further develop their new collection titled SETTO. This new range extends into furniture and lighting products while supporting Australian manufacturing. This new body of work will be officially launched at the Nishi Gallery in New Acton in early 2015. The Workplace Research Associates Award was given to Alex Asch who will be using the CAPO grant to create a bronze sculpture for his 2015 solo exhibition at Beaver Galleries. The Sage Legal Services Award went to Christopher Huet (better known by his stage name C.J. Bowerbird) who will be using the grant for audio recording and performance equipment to expand the artist’s spoken word practice and will be used to develop a performance on masculinity to be shown in the second half of 2015. The Eckersley’s Materials Award will allow Julie Brooke to make new paintings next year developed from her current collaboration with applied mathematicians at the ANU. This work will be exhibited in Sydney and Melbourne in 2015. The Fuji Xerox Australia Sustainable Art Award went to Ashley Eriksmoen and this award will assist her participation as an Artist-­in?Residence at Chiang Mai University Thailand in January 2015 in order to research and develop new works for an intended exhibition later in the year. The inaugural Canberra Weekly Award was presented to Jeremy Lepisto. This award will afford the purchase of a new piece of equipment that will greatly help advance the infrastructure and ability of Jeremy’s small studio in Queanbeyan, as well as be used to expedite the work that he and his wife will make for themselves and for other artists and designers in our creative community. King O’Malley’s Emerging Artist Award was given to Shellaine Godbold Funding for this project will contribute to the costs of having large scale acrylic pieces cut and routed for a new series of acrylic works based on her recent residency and travel throughout South East Asia. The Urban Pantry Manuka Award went to Juliet Moody.The award will assist her group Juliet MoodyThe award will assist Sparrow-Folk’s second recording project, a 5 track EP titled SuBIRDia to support their upcoming show, scheduled to be performed at the Canberra and Melbourne Comedy festivals, as well as Adelaide and Edinburgh Fringe festivals in 2015. Capital Insurance Brokers Emerging Artist Award went to Richielde Flavelle who will utilize it for the purchase of materials for an interactive community installation that will transform Canberra Museum and Art Gallery 4 during Stepping Up: Australian Ceramic Triennale in July 2015. McGrath Woden Emerging Artist Award was given toAnnika Romeyn’s award will support the creation of new paintings and drawings for Annika’s solo exhibition at Flinders Lane Gallery, Melbourne in 2015. The National Press Club of Australia Emerging Artist Award went to Jemima Parker This award will assist with the purchase of materials and equipment to construct a new series of sculptural textile forms to be exhibited at ANCA Gallery, Dickson in May 2015. Alex Asch was born in Boston, Massachusetts, USA and was involved in university art programs in Los Angeles and New York before moving to Australia and studying art at the Australian National University in 1988. He has provided technical assistance to a number of arts organisations around Canberra, and has exhibited extensively in solo and group exhibitions throughout Australia. In 2008, Alex was awarded the Rosalie Gascoigne Award by the Capital Arts Patrons Organisation (CAPO). In 2009, Alex was a finalist in Bondi’s Sculpture by the Sea, and was invited to represent Australia in Sculpture by the Sea in Denmark the same year. Alex’s work is in corporate collections in Australia, USA, UK and Netherlands as well as Artbank, the ACT Legislative Assembly, the Wesley Art Foundation and Canberra Museum and Gallery. … and could cause confusion for a lot of people. Interesting – Beaver is a commercial gallery, so the works will be on sale. Some 65% of the proceeds made under this grant will go to the gallery? Is this usual for arts grants? How long has the powerlifting organisation been in existence? Could this organisation please stop using the name CAPO? CAPO is the Council Of Australian Powerlifting Organisations, the only serious powerlifting group in Australia. To have this local arts crowd hijacking the name CAPO is distressing and could cause confusion for a lot of people.